Every great chef has an equally great story to tell about how they achieved culinary success. Each chef seems to travel the road to success a little differently but the end result is the same – a well-seasoned group of chefs creating wildly diverse cuisine. It’s truly what makes dining out so exciting! One such Chef, Executive Chef Ben Cohn, has been creating sought-after local, seasonal and sustainable cuisine at the Westside Tavern for the last 5 years. However, Chef Ben’s story started well before this. As a native of Maplewood, New Jersey each chapter of his story took him farther and farther West to what could very well be the pinnacle of his career at the Westside Tavern in Los Angeles, California. For Chef Ben the road to become a well-respected executive chef started in the small town of Tucson, Arizona where he took his first restaurant job at a place called Fuego to learn how to cook and pay some bills while in college. It was there that his culinary interest and subsequent career as an Executive Chef was sparked. From Arizona, Chef Ben traveled to the culinary hot spot of San Francisco, California where he worked at Wolfgang Puck’s Postrio and had his first exposure to California Cuisine. This was around the time of the “dot com” era when there were no limits on costs and you were required to source only the very best ingredients from all over the world. 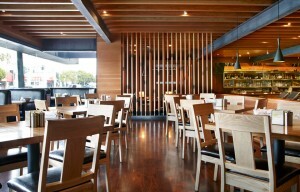 This is where Chef Ben got his “Chops” preparing 500 covers a night of 4-Star food. That’s a lot of covers for even the most casual fare but for 4-Star cuisine that takes precision and passion! 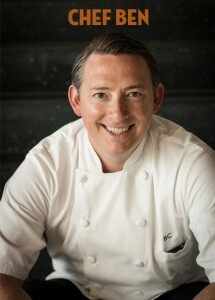 After Postrio, Chef Ben’s journey led him to a few more stops in the Bay Area that further cemented his culinary climb. At Jardinière he worked with Traci de Jardins and cultivated a deep understanding for seasonality and developed relationships with artisanal purveyors of sustainable products. At Masa’s Ben perfected his technical skills with French Laundry trained chef, Gregory Short, and had a natural eye for creating beautifully plated food. As Executive Chef of Spruce, Ben led the restaurant to their first Michelin Star, in addition to accolades from Wine Spectator, The San Francisco Chronicle and Esquire. 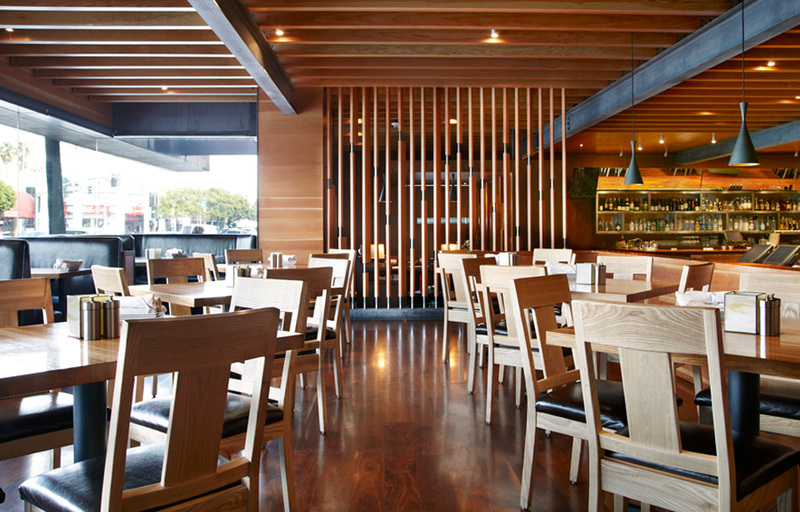 After more than a decade Ben left the Bay Area and moved to Santa Monica, California with his wife and daughter to be closer to family and assume the executive chef position at Westside Tavern. This is where he now currently resides but by no means does his story end here. Westside Tavern can be described as a one of a kind social, urban-minded restaurant, featuring chef-driven New American Cuisine alongside a selection of fresh cocktails, craft beers and a boutique wine list. Their menu celebrates all cultures and cuisine especially those in the local surrounding community. “Supporting local businesses, green initiatives and crafting delicious food is our service standard.” Chef Ben keeps his menu simple, “more than five ingredients and its out,” with fresh locally sourced ingredients and a comfortable atmosphere that brings its customers back day after day. 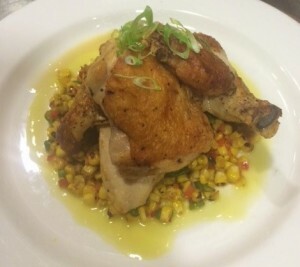 It seems just the spot for a Chef with Ben’s background to create unmistakably creative yet casual food like their Pan Roasted Mary’s Organic Chicken with grilled corn succotash, sautéed Bloomsdale spinach and lemon mustard vinaigrette. 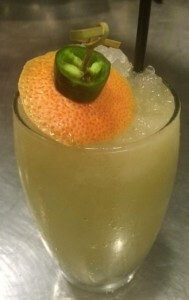 And, while you’re at it why not chase it down with one of their hand crafted cocktails like the Spicy Basil Paloma. Yum! Chef Ben explains that what has ultimately solidified the success of the Westside Tavern in the ultra- competitive Los Angeles dining market are “its loyal following of local clientele, an affordable yet refined menu and a menu that offers seasonality yet keeps the stand byes their customers have come to expect year round.” It seems fairly simple but without the direction of a talented and experienced chef like Ben it just wouldn’t be possible. 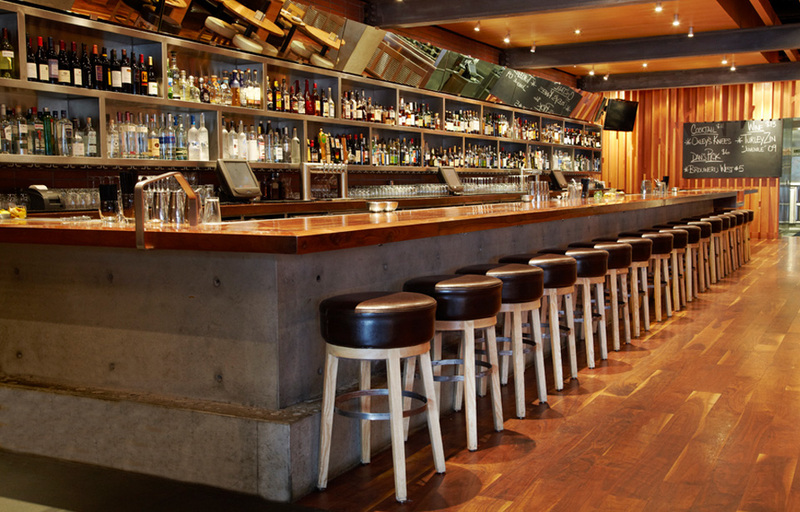 There’s no doubt that Chef Ben and the Westside Tavern will continue to be a force in the Los Angeles dining market and we look forward to being a part of their journey for years to come! 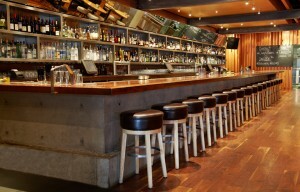 To contact the Westside Tavern go to www.westsidetavernla.com. All of us at Rogers Poultry would like to thank Chef Ben and the Westside Tavern for their ongoing support as a loyal customer and for the wonderful insights they provided allowing us to write such an interesting article. We hope it’s provides some value to our readers and invite all of our customers to participate in our Customer Spotlight. If interested, simply contact your Rogers Sales Associate or call us toll free at 800.889.8280. In a cast iron and/or all clad, heat on high flame and add one oz. of canola oil and heat until lightly smoking. Very carefully, place the chicken in the pan, SKI N SIDE DOWN and give it a slight jiggle to make sure the chicken isn’t sticking to the pan. Lower your flame to low-medium setting and let the chicken cook on the range for two minutes. Place chicken into oven and cook until 165F (Check in 15 min). In another medium sized sauté pan, heat on a medium flame. Add the butter from your Succotash mise en place to the pan and wait for it sizzle. Add your onion, bell pepper, carrot and sweat until the vegetables have becoming slightly translucent. Fold in your corn and green beans and mix with the rest of the vegetables. Season lightly with salt and pepper to taste! Set aside while you check your protein. Once chicken is cooked through, set it aside on a plate or roasting rack and let rest. In the same pan you used for the chicken, return to the stove, and add a small pat of butter. Again wait for it to sizzle. Add your spinach to the pan and wilt. Immediately, season with salt and pepper, taste and set aside. On a large round plate center your succotash in the middle and form a small circle within the rim of the plate. Center spinach in the center of the succotash, and slice chicken breast on a bias and rest on top of the spinach. Next, place the chicken thigh on top of the breast and stack your remaining wing on top of the thigh. Stir your vinaigrette, and drizzle over the chicken and around the outer edges of the succotash. Lastly, sprinkle scallions over the chicken.